I am very happy to show this card using one of the newest images by Scrapper's Delights! It was so much fun to color!! I hope this card serves of inspiration for you to create some of your own!! This fantastic new release has a lot of other images that you can use to add more action to this fun scene!! Well, that sure is a lot of coloring!! But it was worth it!! 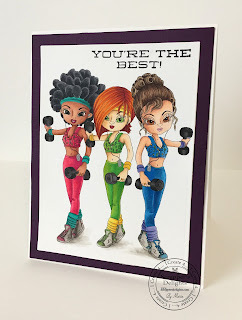 I hope you like my card and I hope to see you join the current Scrapper's Delights Challenge and visit the online store for more amazing images!! I love your sassy workout ladies, and great colouring too!